A fun hands-on circuit that teaches polarity, following directions, aesthetic design and personalization. New vocabulary is also incorporated into the project. Topics covered: switches, designing and reading circuit diagrams, three-dimensional project and deconstruction. 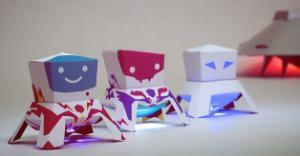 Papertronics are LED toys. Spaceboy, AlienGirl and Tabula Rasa (blank one you can design yourself), they are all electronic and have an LED in them once assembled. They offer a constructionist approach to learning a simple electronics lesson. They are printed with soy inks on recycled paper.